Meet Fahdi and Dania Dulaimi and their two children, Amjad and Mina, ages 2 and 7, respectively. They represent a typical refugee family in their early years of resettlement in Canada seeking to rebuild a life of stability and secure a promising future for themselves and their children. The Dulaimi family settled in Winnipeg, Manitoba, last year as government-assisted refugees after fleeing over a decade of violence and political unrest in their native country of Iraq. In order to finance their government-required medical exams and travel costs, the family acquired a loan of $10,000, which must be repaid within 72 months, at interest. Both parents spent the past year attending language training. This led to Mr. Dulaimi securing a full-time job (35 hrs/week) as a custodian in the school where the language training is taught. Mr. Dulaimi works for minimum wage and is very proud to contribute to his family’s well-being. The position is non-unionized and without health and dental benefits. The family is therefore forced to pay out-of-pocket for dental work and prescription medications. With his experience as a mechanical engineer in Iraq, Mr. Dulaimi would like to complete a bachelor’s degree in engineering in order to fulfill the academic requirement for licensure with Canada’s engineering regulators. However, Mr. Dulaimi cannot afford tuition or books and does not want to take on more debt. Ms. Dulaimi takes care of Amjad during the day and continues to attend language training at night. She would like to join the workforce eventually, but the family cannot afford childcare despite living in a city with relatively affordable childcare by Canadian standards at a monthly rate of $451 for a toddler. Miscellaneous expenses are drawn from the only flexible line item in the family’s monthly budget: food. The Dulaimis already face a $140.10/month shortfall from their most basic monthly expenses. As a result, unexpected expenses can have a crippling effect on their ability to put food on the table. The Dulaimi family often seeks assistance from community charities, places of worship, and food banks to ensure there is enough to eat. $14,868.52 below the poverty line (annual after-tax low-income measure). 48% of recipients are unable to access resettlement services because they are working to repay their travel loans including 24% of recipients forced to quit language training and 22% forced to quit school or other skills training. Canada is the only country in the world to charge interest to refugees on travel loans, a topic which is still being debated in Parliament. Between 1980 and 2005 the incomes of the top 20% wealthiest Canadians increased by 16% while the average earnings among the least wealthy Canadians fell by 20%. Between 1990 and 2009, inflation increased by 45.9%. Most social assistance incomes, however, did not keep up, leaving people currently on welfare worse off than recipients in earlier decades. For women, their labour force participation is strongly affected by their immigration “category.” Women who arrive in the skilled worker category are more likely to be in the labour force (91.1%) than women who enter in the family class (77%) or as a refugee (63.9%). It is unacceptable that the incomes of the top 20% wealthiest Canadians increased by 16% while the average earnings among the least wealthy Canadians fell by 20% over the last 25 years. Add your voice to over 12,000 individuals, organizations, and government representatives who support Dignity for All’s comprehensive, rights-based anti-poverty plan. Together we can work towards a poverty-free Canada. 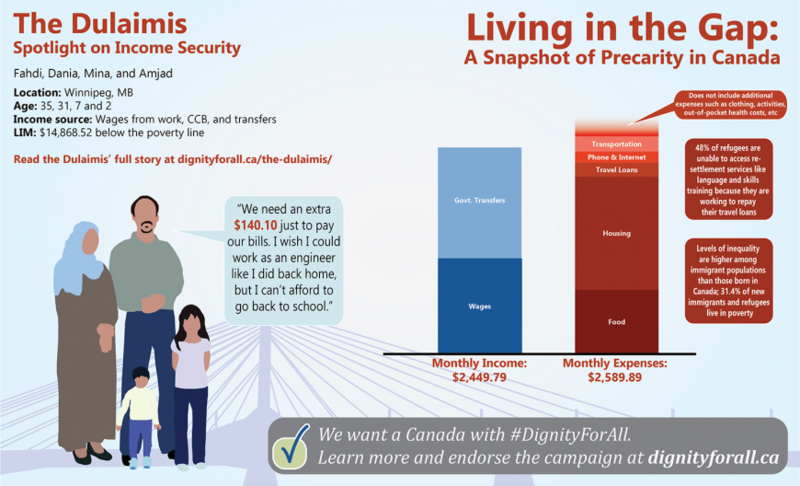 Check out Dignity for All’s one-pager on Income Security for more information.